It’s Monday, which means that I usually wake up very grumpy because I don’t want to start another hectic week of work. Today, it was a little different. I woke up with a BIG smile on my face and in better mood than any other Monday. Why you ask? 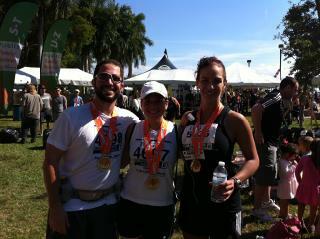 Well, I concluded my 40 day challenge with the Miami ING Half Marathon yesterday and I had a wonderful time. The weather was okay for Miami, not too hot not cold and overcast. A bit humid earlier in the morning but nothing unbearable. I was rather calm of nerves but excited to get the running started that morning. The amount of people and the energy is just amazing. Watching the wheelchair group come in as we all stand around them and cheer them on always gets me a bit choked up. I was ready! Positive talk all the way through. Reminded myself to push through and give it my all. I’m happy to report that I made my goal! I came in at 1:59:10 for 13.1 miles! Oh happy day! It’s such a great feeling when you know you have worked so hard for a goal and see it come a reality. It’ s great feeling of accomplishment and in my case, it keeps me wanting more. 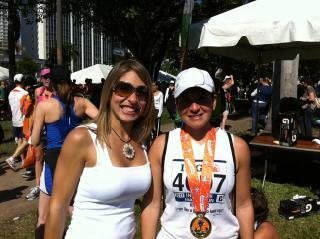 I was also very happy to see friends including my training partner carry out the same goals. Many had a great race too so congrats!